The recent headline in Breitbart was clear enough—and scary: “The Automobile Is Becoming The Weapon Of Choice For Islamist Killers.” That is, running people over. We all saw it in Nice, France, on July 14, as nearly one hundred people died and hundreds more were injured. While Europe has already seen several similar attacks—some of which have been already forgotten or dismissed as the work of the mentally ill—Islamist car assaults are already familiar to the people of Israel. Breitbart Jerusalem reported last night on how Palestinian killers routinely deploy the deadly tactic—with one Palestinian male attempting a car attack against Israeli border police just two days ago. In the meantime, though, stopping vehicular ramming won’t be easy: In 2012, there were more than 254 million cars and trucks in the US; worldwide, the vehicle population is around 1.2 billion. To the delight of motor-minded terrorist wannabes, that’s a lot of death metal. We’ve got to do more to understand that this is a war against these terrorist groups, the radical jihadist groups. It’s good, of course, that Clinton has evolved beyond Barack Obama’s see-no-evil/name-no-evil approach, but it could be that she’s still fighting the last war. Evidently, the new war—the one we’re in now—is against lone, unknown individuals. 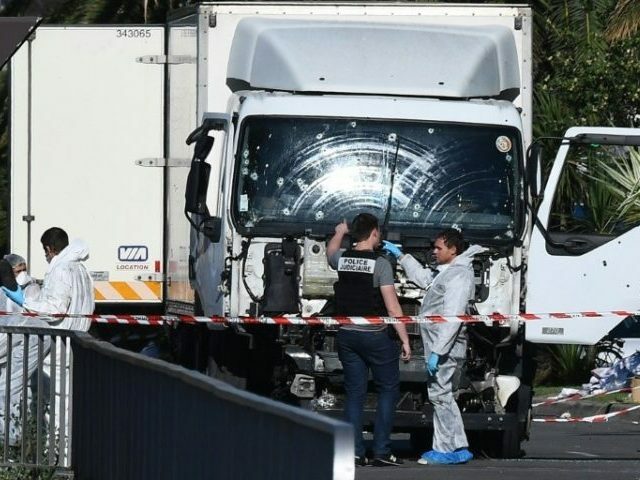 As The Wall Street Journal noted on Friday, the Nice truck attacker, Mohamed Lahouaiej Bouhlel, was not on any terrorist watch list; so far, at least, he seems to have been a “lone wolf.” Now of course, it often turns out that lone wolves weren’t so lonely; they had help, or at least inspiration, from somewhere, quite possibly on the Internet. And the Internet, of course, connects the entire world—although maybe not in a good way. With the right encryption app, it’s now possible for Terrorist A to share plans, or at least ideas, with Terrorist B, and the authorities are none the wiser. Is that free speech—or conspiracy? The only thing we know for sure is that since Silicon Valley has consistently beaten back efforts to crack encryption, the good guys are operating mostly in the dark. In other words, while it’s a step forward that Clinton is willing to confront jihadi groups, thus risking the wrath of Obama, the ACLU and CAIR, it could be a case of too little, too late. The new threat is from individuals who may, or may not, rely on encryption; it’s possible that some of them are responding only to the voices in their heads. Thus it could be that “groups” are yesterday, while individuals are today. So Hillary can make plans to build her Maginot Line to block dangerous groups; meanwhile, dangerous individuals are scurrying through, unnoticed by authorities. Here at Breitbart, I have written that we need to get a lot smarter about the terrorists’ war against us, even as we get a lot tougher in dealing with the terrorists themselves. And now we can further observe that this new-war reality suggests that immigration control, as well as broad surveillance, must be a key part of the strategy. That is, if the new threat is from jihadi-prone individuals who one day wake up and decide to kill, then maybe the best solution is that we don’t need so many such people within our borders. And maybe we also need better ways to keep track of them, whether or not they are tapping on their laptop or smartphone. Yes, dangerous sub-populations require steady surveillance—there’s no way around that. And if that offends the civil libertarians, well, they should have thought of that before they opened the border and let the killer wannabes pass through. Sadly, we forgot the basic wisdom of the wall. We all intuitively understand the value of walls and fences; even ACLU members live in dwellings, not out in the open. And throughout history, people—as nations and as individuals—have kept themselves contained. Savages may live under the trees, but civilized people live behind walls. Once upon a time, of course, walls in public places were common; many countries built walls along their frontier, the most famous of which is the Great Wall of China. But in addition, every city existed behind a wall—or else it didn’t exist. Indeed, many cities built internal walls, too, as a form of compartmentalization; Istanbul, for example, has three such echelons, and a sea wall, too. Even individual houses, not just royal castles, were built as fortresses. Outside of San Antonio, TX, is the fort-like Gallagher House, built in 1833, in conditions of near anarchy, for protection against constant Indian raids, plus the occasional Mexican marauder. The Gallagher House is still there for tourist visits; of course it is, the walls are two feet thick, and so it’s not going anywhere. Thus we can see: If government protection stops working, people start bricking! Yet in the last five hundred years or so, gunpowder and artillery have changed the defensive calculation. If cannon balls can knock down a wall slowly, explosive shells can knock it down quickly. And so the vision of the ideal fortification has shifted—from the highest possible wall to the deepest possible bunker. Yet either way, the basic idea is the same: You don’t know precisely what threat is coming; all you know is that a threat is coming. So, to be ready, you build a system of what’s called passive defense; that is, it just sits there. The opposite of passive defense is active defense; that is, a mobile army. Active defense is good and necessary, but it’s more expensive. And the real answer, of course, is that we need both—and hybrids in between, suitably updated with the latest technology. Perhaps I should explain. This author was in Washington, DC, on October 23, 1983, when news came that a Hezbollah truck bomber had rammed the Marine barracks in Beirut, killing 241. By the next morning, Uncle Sam had moved fully-loaded dump trucks into the driveway of every government office building. Indeed, at that time, it seemed as if the only high-value target left unblocked was the Reagan-Bush ’84 campaign headquarters on Capitol Hill, where I was working. Back then, as I walked through the big glass lobby and took the elevator to the sixth floor, I had plenty of occasion to think how vulnerable the Reagan campaign was: Ed Rollins, Lee Atwater—all of us. Within weeks, the dump trucks were replaced by barriers of other kinds, typically big planters. And over the decades since, the bollard has become a ubiquitous presence; in many big cities now, we see those stubby things, sitting there like the castle walls of yore. In other words, the past is back—we can think of it as the once and future castle. To be sure, bollards won’t stop an individual on foot; that’s why we have cameras, sensors, and security guards. But bollards will stop a vehicle, and as we have seen, that can be a life-saver. And yes, like castle walls, bollards can be blown up with explosives to clear them away, but we don’t seem to be at that threat level—at least not yet. So in the meantime, if the new risk is from vehicular rammers, do we need a lot more bollards? In a word, yes—at least until someone comes up with a better idea. Indeed, the history of counter-terrorism is replete with instances in which we realized, only too late, that better passive defenses were needed. For example, in the middle of the first airplane hijacking wave, in the early 1970s—when the hijackers would mostly settle just for going to Cuba—we instituted metal-detector screening at airports. Ever since, it’s been expensive, and a big pain, but nobody has come up with a better alternative. And so for more than 40 years, we have been in a technological arms race of a kind, to see who can be more clever, the sneakers or the detectors. Then, as we have seen, after Beirut, the solution was the bollard; after 9-11, the armored cockpit door. Of course, after 9-11, we didn’t just engage in enhanced passive defense; we also tried active defense, including the occupation of Afghanistan and, much more dubiously, Iraq. In the last 15 years, we have learned that it’s hard to go hunting for terrorists and quasi-terrorists in their homelands. Our soldiers are skilled, brave, and well-equipped, but they typically don’t know the local ways, to say nothing of the local languages. And so unless we wish simply to kill them all, we have to realize that our capacity to make change among these populations—to win hearts and minds, as was said of an earlier lost cause—is profoundly, heartbreakingly, limited. Indeed, from these overseas ventures, we seem to get boomerang and blowback, at least as often as we gain an evanescent success. As noted, passive defense often works better than active offense—and it is definitely cheaper. Stopping them here beats chasing them there. In the long-running BBC TV series Dr. Who, there are characters called Daleks; they look like bowling pins, or bollards. But they are mobile, as well as, alas, evil. And yet even if the Daleks are bad, they can still serve a good purpose—we can learn from them. That is, they can remind us bollards can be transportable, maybe even self-transportable. So if the truck-attacks continue—and serious attacks of some kind seem to be happening every three or four days now—and we want to continue with our lives, we will have to adapt. In particular, if we maintain our habit of dining al fresco—that is, outside, beyond protective walls—we will have to make changes. And maybe that change should include more passive defense, including mobile bollards. That is, if we are having an outdoor event anywhere near vehicles, we just set up bollards, the way we now set up rope lines, stanchions, or, occasionally, jersey barriers. Down the road, as it were, we can think about even more advanced kinds of passive defense, from sensors, to drones, to lasers, deflector shields, and force fields. Again, it’s worth emphasizing: No kind of defense, passive or active, will work if the population contains too many killers. With a dangerous population, there will always be danger—and with open borders, there will always be risk; it will always be a cat-and-mouse game. So let’s not lose sight of the importance of border walls. In addition, let’s not forget virtual border walls—at, for example, airports. After all, a jihadi who has overstayed his visa, or has come here as the result of some NGO charity project, is vastly more of a threat than someone who came here by swimming across the Rio Grande. Yet since we’ll never completely know who is dangerous and who is not, let’s start upping our passive defenses. This new infrastructure undertaking might not be cheap—although, in this era of record low, even negative, interest rates, it will be cheap to build, and it will create lots of blue-collar jobs. And any case, no matter how great the cost, we’re worth it.